The Sports Swimming Pools is a unique place for all swimming lovers. The complex features Olympic-size swimming pools created for both water sports amateurs and professional sportsmen. 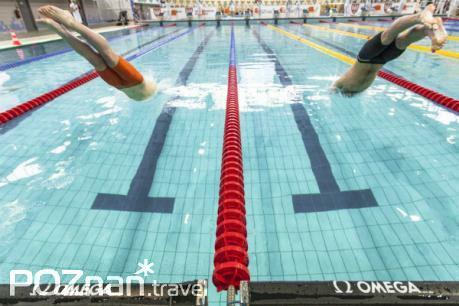 A 50-metre Olympic-size swimming pool with spectator stands for 4,000 people is available for our guests as well as for competitions like World and Europe Championships. The swimming pool can be divided into two 25-metre pools. The other pool with a depth of 5 metres and with a diving tower fulfils all requirements necessary for organizing sports competitions. The Termy Maltańskie complex may host any championships in most water sports disciplines, e.g. synchronized swimming, water polo, freediving and snorkelling. Our offer also includes various courses and activities for children and adults, such as swimming lessons, aqua aerobics or aqua zumba.